Godmother Emma Pontin christened Celebrity Eclipse in Southampton on Saturday. Photos are located in a newsfile on the CND website. Seabourn Sojourn completed sea trials and has returned to T Mariotti yard in Genoa. 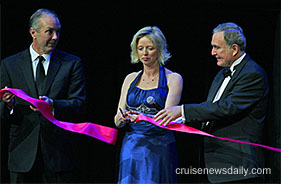 A larger photo is in a newsfile on the Cruise News Daily website.